Despite significant progress, women and young children living in Nepal’s most remote areas continue to face high rates of mortality. 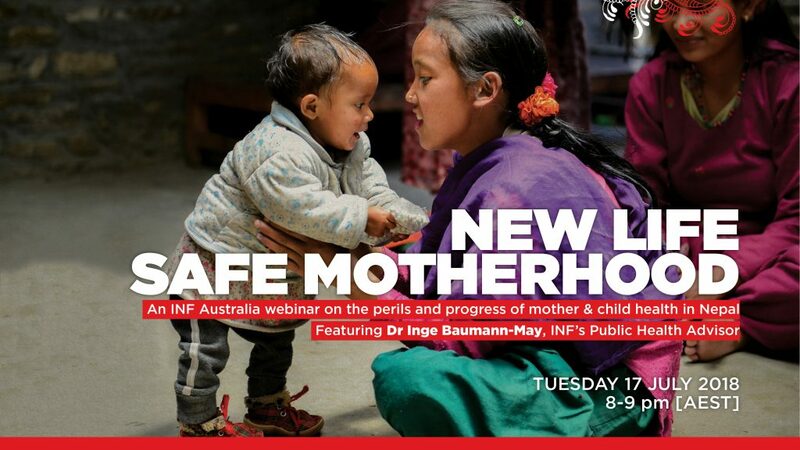 Dr Inge Baumann-May, INF’s Public Health Advisor, will share her personal experience working in Nepal in a webinar on Tuesday 17th July. She’ll discuss the perils and progress being made as well as the capacity building work of INF’s Maternal Newborn and Child Health programme [MNCH]. INF is focused on improving the health of mothers and children under two years old. The MNCH programme raises community awareness around healthy practices for pregnant women and their infants; strengthens the knowledge and confidence of female community health volunteers and birth attendants; supports health posts, birthing centres, government health bodies and regional hospitals. There are already many stories of how INF’s programme, established in 2013, is transforming the lives of women and children in Nepal. “Over the last 20 years there have been huge improvements in public health and maternal and child health in Nepal, but maternal and child mortality and morbidity rates are still unacceptably high as many people still do not receive the basic help they need,” says Inge. Inge has extensive experience in public health and community development, with a focus on maternal and child health. She has worked in Germany, Kenya, Liberia, Uganda, Indigenous communities in the Northern Territory, in Australia and since 2015, Nepal. Inge has a Masters in Community Health, and PhD in Public Health. She brings a breadth of knowledge, a deep passion for her work, and is an engaging and accessible speaker. You’re invited to join the webinar run by Dr Inge Baumann-May.